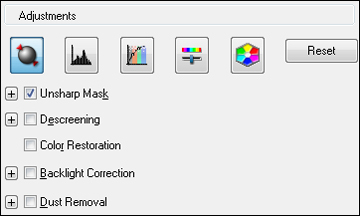 You can select these Adjustments options in Epson Scan Professional Mode. Not all adjustment settings may be available, depending on other settings you have chosen. Click the image adjustment icon to access additional settings. Click the + (Windows) or (OS X) icon next to a setting to change the level of adjustment. Automatically adjusts the image exposure settings when you click the Auto Exposure icon. To automatically adjust image exposure settings continuously, click the Configuration button, click the Color tab, and select Continuous auto exposure. You can adjust the level of auto exposure using a slider. Provides a graphical interface for adjusting highlight, shadow, and gamma levels individually. (For advanced users only.) Click the histogram icon to access the settings. Provides a graphical interface for adjusting tone levels individually. (For advanced users only.) Click the tone correction icon to access the settings. Adjusts the balance of colors in the overall image. Provides a graphical interface for adjusting mid-tone levels, such as skin tones, without affecting the highlight and shadow areas of the image. (For advanced users only.) Click the Color Palette icon to access the settings.